But in all honesty the bathroom is one of the areas I loath cleaning and with 3 boys in the house the toilet really is horrid. I am always on the look out for products that help make this chore a bit easier and a little less dreaded. Recently I became a Purex Insider and through this connection I was able to review Soft Scrub 4-in-1 toilet care with bleach. 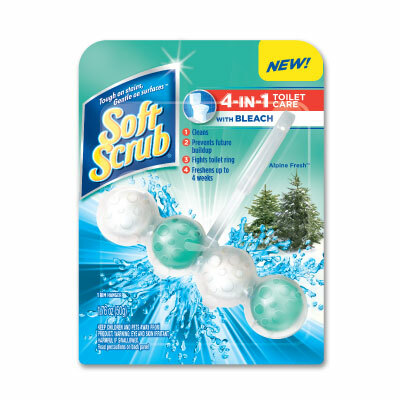 NEW Soft Scrub 4-in-1 Toilet Care provides long lasting cleaning and freshening thanks to its unique design and advanced formula. and makes my bathroom smell like Alpine Fresh pine. And when I say easy to install I mean it! I simply had to open the package, unfold the hanger and hang it off the rim in the direct flow of water. So easy! And today 3 Simply Me followers have the chance to win a coupon for a free Soft Scrub product!! I am a Purex insider and was provide a sample to facilitate my review. I was not paid in any way to write this review all opinions are my own.